Hazelnut trees are cultivated in the countries of the Mediterranean and along the Black Sea Coast. Three quarters of global production come from Turkey, although countries like Georgia and Azerbaijan are catching up quickly in terms of quantity and quality. Other countries like Spain, Greece or the USA currently play a lesser role in hazelnut cultivation. Italy’s growing regions, namely the area around Vesuvius, the “Roman” in northern Italy and the province of Piedmont, are worthy of mention. Hazelnuts are rich in proteins, complex carbohydrates, fibre, iron, calcium and Vitamin E. Like other nuts they contain no cholesterol and little sugar. 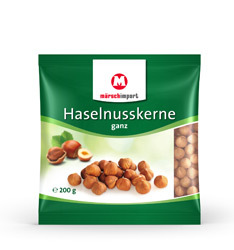 Over 80 % of the fat content of hazelnuts comes from monounsaturated fatty acids.